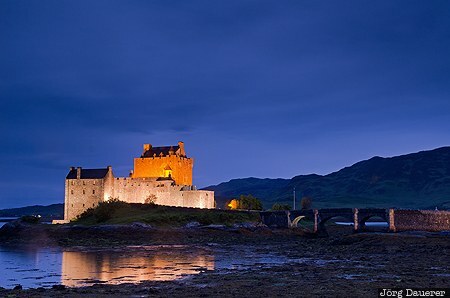 The iconic flood-lit Eilean Donan Castle at the blue hour just after sunset below a cloudy sky. Eilean Donan Castle is near Dornie, Highlands, Scotland, United Kingdom. This photo was taken in the evening of a cloudy day in June of 2013. This photo is part of the exhibition Castles (June 2012). This photo is in the Photo Calendar "Scotland". This photo was taken with a digital camera.